A gnome helper that keeps your wardrobe organized. At least tries to. from making one. 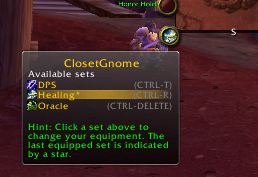 ClosetGnome_BigWigs can be used to equip sets per boss. the command /cg wear <set>. any weapons, the weapons will be switched immediately if that option is on. Red: Slot is inactive and any item currently equipped in the slot WILL NOT be saved or equipped. Green: Slot is active and any item currently equipped in the slot WILL be saved for equipping in the future. Yellow: Slot is active BUT the item for that slot is missing. When the set is saved the missing item will be saved for that slot, NOT the currently equipped item. slot. This will make the slot appear blue and force the slot to be active. Empty slots can not be used for icons. There are several addons that add extra functionality to ClosetGnome, and they're all available on http://files.wowace.com. Including ClosetGnome_Mount, _Banker, _Tooltip, _Switcher, _Zone and others. Do realize your reply is irrelevant to the original question? Not to mention, it's the WoW itself showing that info. It's not possible. After r620 ClosetGome has switched to use Blizzard's fubared equipment manager, which does not provide any such information. Earlier versions wrote which item set it belonged to and that is now missing. It's too easy to sell somehting when you have dualspec. Any chance we can get a simple "Itemsetname" in the infotext? Or do anyone know an addon that solves this? Get in reach and you get a Greater Heal on Turalyon. For about two weeks now (could be since 3.1.2) the minimap button doesn't show up anymore. I checked the savedvariables file, but couldn't find anything, probably because I never changed the button's position. Comment out or just remove this string. Errr... dand, it really wanished... without any errors. Last edited by AnrDaemon : 05-20-09 at 05:38 PM. Ok I found a way to create or edit sets! Maybe someone can do something more with this for finding a temp fix until the addon is updated? ClosetGnome is saying it is loading. it shows up under the wow interface listing as running. i do not get the mini map icon and the /script marco to change sets is failing. i have tried deleting the wtf folder and running only closetgnome to rule out a conflict with another addon. Thanks for the great addon. It looks like it underwent a few changes around the release of patch 3.1. The menu is quite a bit simpler, and the text-based commands no longer work. Are there any plans to add these back? It was nice being able to type "/cg wear <item set>" and not have to create a macro or use the map icon. Commands was removed 2 or 3 releases ago. Read addon info page for the way to equip sets by name. Feel free to create addon that would reinstate the commands. I've been running ClosetGnome for a bit now, as Outfitter has closed down and the built-in gear manager has been put on hold, but I keep getting an "<AddOn name> has been blocked from an action only available to the Blizzard UI" error whenever I post a GM ticket while ClosetGnome is running. quie offtopic, but thought id ask anyway, now that i have closetgnome, and use talented to save my talent specs, prot dps etc, wheres the addon that keeps track of where macros and spells should be placed on your actionbars?, im using bartender4 atm. any help with be awsome. cheers on a great mod.